Nepal’s government strikes out at India after rumors of a Delhi-backed attempt to oust the current prime minister. Strained Nepal-India relations, which looked to be heading toward a thaw, faced another jolt earlier this month. The Nepali government abruptly canceled President Bidhya Devi Bhandari’s first trip to Delhi, followed by the decision to recall Nepal’s ambassador to India, Deep Kumar Upadhyay. India has been criticized for its alleged involvement in the attempts made by some parties to topple the incumbent government in Nepal. Following unexpected moves by Nepal’s government, Indian Prime Minister Narendra Modi reportedly has decided to boycott the International Buddhist Conference that is scheduled to take place from May 19-20 in Kathmandu. After Prime Minister KP Oli visited Delhi in February, Nepal-India relations, which have been tense since Nepal adopted a new constitution in September last year, were heading toward a thaw. The Eminent Persons’ Group (EPG), a mechanism formed by both countries, was set to begin reviewing the state of Nepal-India relations and suggest ways to normalize ties. The smooth supply of day-to-day needs from the Indian side has resumed after last fall’s economic embargo. But Nepal’s recent decisions to cancel the president’s India trip and recall its envoy to Delhi created a crisis of confidence between two countries. Oli apparently believes that India was directly involved in the attempts made to topple his government in the first week of May. Senior leaders of the ruling coalition government who are close to Oli have told the media that India tried to oust their government. “India tried to topple the government, forcing the main opposition party Nepali Congress President Sher Bahadur Deuba to take the lead in the process,” said Bamdev Gautam, a senior leader of the ruling CPN-UML, in an interview with Kantipur Daily, the largest selling Nepali-language daily. Ambassador Upadhyay, a senior leader of Nepali Congress, has been blamed for lobbying the Indian establishment to topple the government. However, Upadhyay dismissed the accusations, saying that he does not have the capacity to topple or form the government. India’s ambassador to Nepal, Ranjit Rae, has also been accused of being involved in the conspiracy to oust the coalition government of left parties, which is often portrayed as an anti-India coalition. Last week, there were some media reports that Nepal would expel the Indian ambassador for his alleged involvement in the internal affairs of Nepal. Nepal’s government has denounced those reports. “Some media speculation regarding [the] Nepali government mulling expulsion of Indian Ambassador Rae is baseless and is aimed at damaging Nepal-India relations,” said Minister for Foreign Affairs Kamal Thapa. There is an agreement among political parties in Nepal that India’s policy of “micromanaging” its smaller neighbor should not be tolerated. Similarly, all parties in Nepal protested India’s tactical support to the border blockade launched by Madhesh-based parties last year. However, the present government’s diplomatic dealings have been problematic, especially after the promulgation of the constitution last year. Government officials are straining to show off their nationalist credentials, provoking issues related to relations with neighboring countries. The CPN-UML-led current government is dominated by leftist and rightists parties—UCPN (Maoist), CPN-ML, Rastriya Janamoarcha, and Rastriya Prajatantra Party-Nepal among others—who try to portray themselves as nationalist forces by criticizing India. Even government ministers have been making provocative statements, saying that India is trying to split Nepal’s southern belt. Oli believes that India did not want Nepal to form a government under his leadership. He is also of the view that India is not supportive of his government, so he is indulging in anti-Indian rhetoric to earn nationalist credentials. India, on the other hand, believes that the current government is working to create anti-Indian sentiment in Nepal. Ironically, Oli had been portrayed as a pro-Indian leader over the previous 25 years. In the third week of February, Oli visited India. At the time, the prime minister claimed that the misunderstanding between the two countries had been cleared after his visit. However, in a sign that all was not well, Nepal and India failed to come up with a joint press statement after India refused to welcome Nepal’s constitution. The protests of Madhesh-based parties over the promulgation of Nepal’s new constitution is another issue that is influencing Nepal-India relations. Ethnic groups are protesting in the southern belt, bordering India, demanding the government in Nepal address their concerns about the demarcation of electoral constituencies. 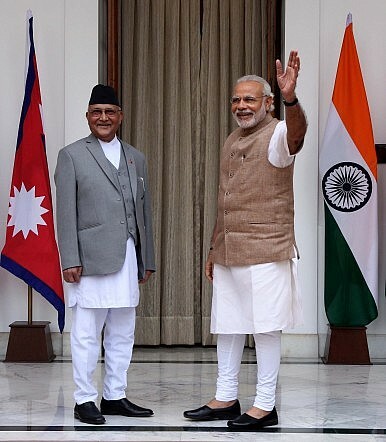 India is pressing Nepali parties to address the concerns of Madhesh-based groups. Oli and his cabinet ministers believe that India is interfering in Nepal’s internal issues by providing tactical support to protesters. The problem is that Oli seems more interested in political gain than truly forging national unity. Oli has not invested the time and energy to reach out to opposition parties and Madhesh-based groups in order to create an environment of implementing the constitution. Following pressure from opposition parties, Nepal adopted amendments to the constitution, partially fulfilling the protesters’ demands. Then, a day before his visit to India, Oli formed a political mechanism led by the deputy prime minister and the minister for foreign affairs to address the remaining demands. The mechanism was made in a hurry to give the impression to the Indian political leadership that Oli was serious about resolving the Madhesh crisis. Since he returned from his India visit, there has not been even a single round of negotiation between the government mechanism and Madhesh-based parties. There are just 20 months left to fully implement Nepal’s constitution, otherwise there will be another constitutional crisis. In this period Nepal will have to hold local, provincial and national elections, which is a very tough job. It won’t be possible without unification among the parties. In this sense, Nepal’s government is failing to handle both domestic and external issues properly, which is pushing the country toward crisis. Instead of taking a strong and united balancing approach, leaders are providing India and China with room to play in the country’s internal political affairs. In addition to the reports that India tried to topple the government, it’s rumored that China worked hard to keep the current coalition intact. The lack of unity among Nepal’s domestic forces means that diplomacy is becoming a tool for parties to gain domestic political strength. Kamal Dev Bhattarai is a Kathmandu-based journalist who frequently writes in international media about politics and social issues. He has recently written a book about Nepal’s peace and constitution drafting process tiled Transition: From 12-point understanding to constitution promulgation. Pakistan and Nepal rarely exchange bilateral visits. This trip -- under the gaze of India and China -- has made waves.